Yesenia Mora and Joey Moray will be singing up a storm during the free performance of “Memphis” by Genesius Theatre. If you missed Genesius Theatre’s sold-out production of “Memphis – The Musical”, you’re in luck – a one-time performance will be presented free to the public on Sunday, September 16! The outdoor performance will be staged at 2 p.m. in the courtyard behind Penn Square Center at Sixth and Penn Streets. Just bring a lawn chair or blanket and enjoy the show (there is no seating in the courtyard other than a few benches). The musical will be presented with a live 10-piece orchestra, full cast, and set pieces. In case of inclement weather, the show will be moved to one of the ballrooms at the Santander Performing Arts Center near Sixth and Walnut Streets. The decision to relocate the performance will be made by 10 a.m. the day of the show. Check the Genesius Facebook page or www.genesiusdifference.org for that information. “Memphis” is being presented in cooperation with the Reading Downtown Improvement District and the City of Reading. The special presentation is being funded by a grant from the Berks Arts Fund of Berks County Community Foundation. Set during the early days of rock ‘n’ roll and underground dance clubs, “Memphis” is an exhilarating tale of love and fame, filled with high-energy music and explosive dancing. 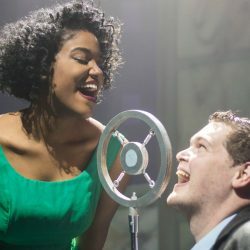 Inspired by actual events, the musical is about Huey Calhoun, a white radio DJ, who wants to change the world by playing “race music” on a popular white radio station; and Felicia, a black club singer who is ready for her big break in a world that is totally closed off to African Americans. This humorous, yet poignant story is craftily written by Joe DiPietro (who also penned “I Love You, You’re Perfect, Now Change” and “All Shook Up”) and set to an original score by Bon Jovi’s David Bryan. It evokes the powerhouse funk of James Brown, the hot guitar riffs of Chuck Berry, the smooth harmonies of the Temptations, and the silken, bouncy pop of the era’s great girl groups. The show is rated PG. For more information, go to www.genesiusdifference.org or call the theatre at 610-371-8151.